Hundreds of young undocumented immigrants and their allies from Florida to California came to Capitol Hill Monday – the day President Donald Trump set for the end of the Deferred Action for Childhood Arrivals program – to protest and lobby members of Congress to pass legislation that would protect them. The protesters held sit-ins at lawmakers’ offices, including one outside House Speaker Paul Ryan‘s office, and outside the Capitol chained themselves to one another, closing a nearby street to traffic. U.S. Capitol Police said they made 87 arrests, 68 outside and 19 inside the Capitol. All arrested were charged with “crowding, obstructing, or incommoding” and 28 of the protesters were charged with resisting arrest, police said. Immigration activists chain themselves together on March 5, 2018, on Capitol Hill. Across the street, Adela Munoz stood watching as her friends sat on the yellow lines of Independence Avenue for the protest. Munoz, a 19-year-old DACA recipient from Phoenix, Ariz., made the trip with seven others, including Arizona Democratic state Rep. Isela Blanc. Munoz watched as Blanc and two of their other friends were arrested. “I told them that I was thankful because they don’t need to be here, but they see the urgency of it. They see that we need help because our voices sometimes don’t get heard,” Munoz said. Munoz stayed on the sidewalk with two other friends, also Dreamers, because an arrest could mean losing their DACA protected status. “They can actually get arrested, some people can’t,” Munoz said, tearing up. She and her friends traveled to Washington to protest for a Dream Act extension not linked to a border wall or other immigration security issues. Six months ago, Trump picked March 5 as the deadline for Congress to work out a solution to prevent DACA recipients from facing deportation. However, multiple court challenges have prevented the Trump administration from ending the program. 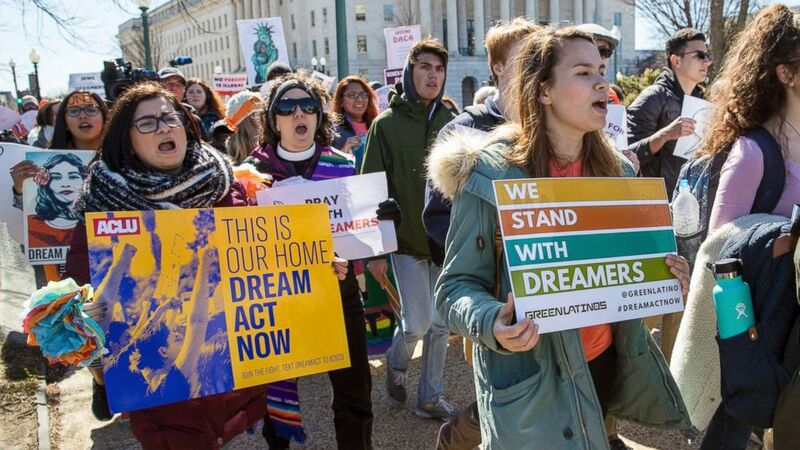 Now, as Congress and the Dreamers await a resolution in the courts, lawmakers have paused their legislative efforts and some 700,000 DACA recipients have been plunged into a constant state of uncertainty. While DACA renewals are being processed on the Obama-era terms that were in place before DACA was ordered rescinded, no new applications are being accepted. There were approximately 22,000 initial DACA grant requests pending as of January 31, 2018. Tony Ibarra, a DACA recipient from Wichita, Kansas, applied before they stopped accepting new applications. His DACA status expires in October 2019. The protesters also laid flowers across the grass around the Capitol, spelling out “unafraid” in big letters that could be read from the windows above. Protesters chanted “mas flores,” or more flowers, as they moved from letter to letter and filled out the word. Cecilia Ruesta, a masters student from Fresno, Calif., said her flower was for her brother. Ruesta, originally from Lima, Peru, is an organizer with United We Dream, the organization behind the flowers. Ruesta received citizenship a year ago, but her brother, whom she lives with, is still undocumented. Laying the flower was “definitely emotional,” she said.